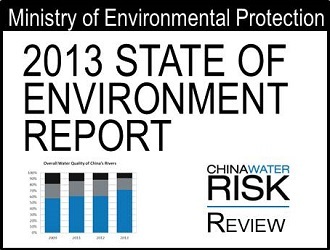 The MEP 2013 State of Environment Report issued on 4 June 2014 says that the overall environmental quality was ‘average’. It added that as there was no serious degradation of the ecosystem, the overall ecological environment quality is ‘stable’. In addition, there are discrepancies in different sets of pollution data published by various environmental protection authorities – we cover this in “Pollution: Is the Data Real?”. Groundwater pollution remains severe in 2013 with groundwater in the ‘bad’ to ‘very bad’ categories at 60% compared to 57% in 2012. Groundwater conditions have now worsened year-on-year over the past three years since 2011 despite the National Groundwater Pollution Prevention and Control Plan issued at the end of the same year. This is worrying as 70% of China’s 1.3 billion population plus over 60% of China’s cities primarily rely on groundwater as drinking water source. The overall water quality in the river basins has been improving since 2009 with water “unfit for human touch” falling from 43% to 28%. 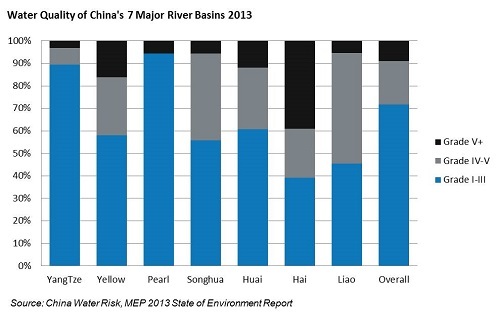 Grades I-III water quality of China’s rivers has significantly improved since 2012 rising from 61% to 72% in 2013. Even water that is not useable for industrial or agricultural use (Grade V+) water has shrunk from 11% in 2012 to 9% in 2013. Water quality of the Yangtze, Huai and Liao Rivers has improved significantly with Grade V+ water falling by 30%, 35% and 63%, respectively. Only 3.1% of the Yangtze and 5.4% of the Liao remain not useable for industry and agriculture; these percentages are the lowest out of the seven rivers. This is a considerable improvement in Liao in particular as 36% was not useable for industry or agriculture in 2009. 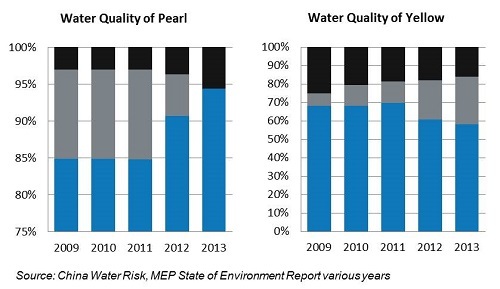 Although the Pearl River saw a rise in Grades I-III water quality from 91% to 94%, the amount that is not useable for agriculture and industry has worsened and Grade V+ water in the Pearl River is now over 5%. The Yellow River on the other hand saw deterioration in overall water quality with amounts unfit for human touch reaching 42% compared to 32% in 2009. Finally, the Songhua and Hai Rivers have given back the previous year’s improvement. 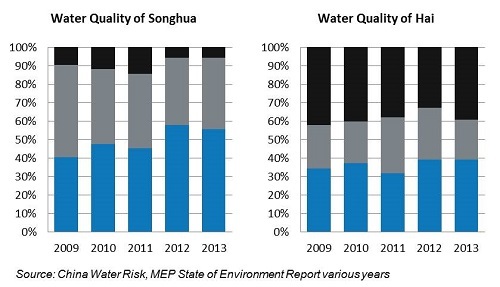 The Songhua is slightly worse off with a 4% fall in Grades I-III water and an increase of 6% in Grade IV-V water, whilst Grade V+ water remained flat. The Hai remains the most polluted river with 61% of water categorized as unfit for human touch but Grade V+ water that is not useable by both agriculture and industry has risen from 33% in 2012 to 39% in 2013. In 2012, 62 key lakes and reservoirs were measured. In 2013, only 61 key lakes and reservoirs were measured. No explanation was given as to the why there are only now 61 key lakes & reservoirs. Also, the evaluation criteria has changed from Grades I-V+ to excellent, good, light pollution, medium pollution & heavy pollution. Again no explanation was given. Changing definitions and sample sizes, makes it difficult to compare year-on-year performance and no explanation of the change does cast suspicion toward a cover-up of worsening conditions. Considering that lakes and reservoirs are often drinking water sources, such incomparability of year-on-year data is concerning. Besides not being able to compare the progress on lakes, quality of water in China’s lakes & reservoirs are now also not comparable to China’s rivers. Can EIA reform & special funds help to achieve the 12 FYP emission reduction targets? Pollution emissions need to be controlled at source. Aside from increased and consistent monitoring of discharge, China needs to prioritise EIA reform so that the EIA becomes an effective tool in preventing the construction of polluting projects. In 2013, 241 EIA approvals were given to construction projects amounting to investments of around RMB1.9 trillion whilst 32 projects amounting to RMB118.4 billion were rejected or suspended as environmental requirements were not met. Rejection and suspension rates have respectively risen 10% to 13% from the previous year. Could this be an indication of a more stringent EIA approval process in the future? RMB6 billion for rural environmental protection including RMB4 billion for livestock & husbandry pollution treatment – this amount is 9% more than that set aside in 2012, reflecting that the MEP’s stance that the rural environment still ‘remains grim’. That said, the MEP indicated that they are on track to meet the 2013 targets for COD, Sulphur Dioxide, Ammonia Nitrate and Nitrogen Oxide with reductions of 2.9%, 3.5%, 3.1% and 4.7% respectively. So it does look like we will make the 2014 12FYP reduction targets. But is meeting these targets enough when there are discrepancies in different set of pollution data published by various environmental protection authorities? More on this here. For now, given the war on pollution in 2014, we expect to see a much clearer and less grim picture in next year’s State of Environment Report. Pollution: Is Data Real? – Inconsistencies in the recording and reporting of pollution data begs the question: is the data real? With 7,700 tonnes of lead in China’s rivers carried to the sea unaccounted for in 2011, is the real state of environment worse than we thought? Pollution: Is the Data Real?